Stores & transports up to 16 Boards at a time! Holds both 12" and 16" Scooter Boards. Low center of gravity for stability, even over bumps. Ultra Glide casters roll smoothly on carpeting. Yes I would recommend this to a friend or colleague. I use this to store my scooters and it is easy to move them around. 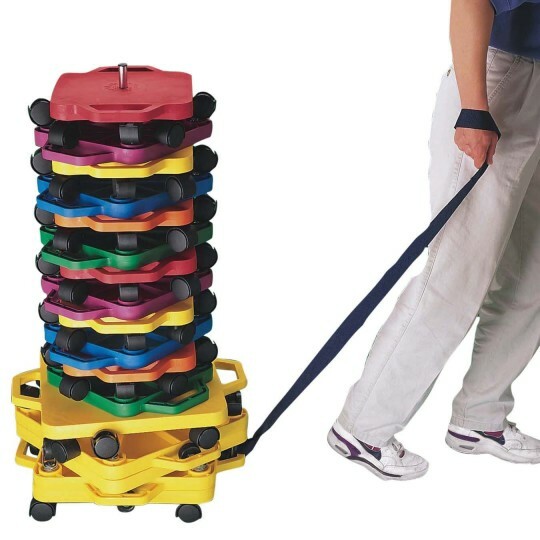 Use this to transport and store scooters. Keeps scooters organized. Saves Time getting PE materials ready for class. Ok product. A bit flimsy designed but it keeps the scooters all together in one location. Nice way to keep scooters tidy and together. My only complaint is that the screw holing the pole in place has to be tightened often. Certainly not a big deal. Priced right for my meager budget.